Mr. Olex sets the direction for the SlashDB business and product. He is a pioneer of Resource Oriented Architecture, a new approach to data integration, in which database content becomes discoverable and easily accessible in full context and standard data formats. He is the founder of vt.enterprise, the company behind SlashDB and a software consultancy operating in the greater New York metro area since 2001. Prior to vt.enterprise, Mr. Olex enjoyed a successful career in financial technology. He worked as a technology architect and lead software engineer for Harbert Management, Dresdner Kleinwort Wasserstein (now Commerzbank) and ING Barings. Preceding his career in financial technology was one in the telecommunication industry at American Management Systems (now CGI) where he worked as a consultant on billing systems to Europe’s leading mobile telephony operators. He began his professional career while at school working part-time as a software developer and graphics designer. 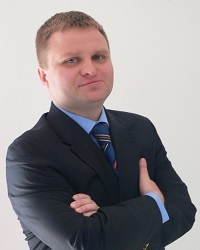 Victor obtained his bachelor’s degree in Computer Science from the Polish-Japanese Institute of Information Technology in Warsaw, Poland, graduating at the top off the class. He particularly enjoyed studying databases and operating systems. As a first generation immigrant he believes that above all motivation is the key to success. In his pastime Victor enjoys snowboarding, tennis and cycling.